This entry was posted in Personal stories on 2018/04/04 by Susan. 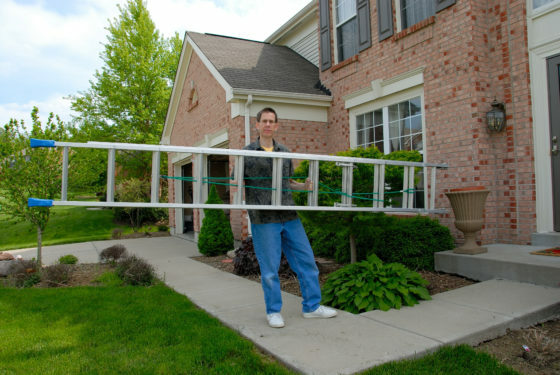 Please use caution when carrying ladders through passageways, doorways, or any place where your view is obstructed – I was nearly hit by one last spring. It’s time for spring cleaning! But before you haul out your ladder at work or at home, I have something to say about ladder safety. Usually we talk about setting up and using ladders properly, which is obviously an important safety issue. But it’s also critical – for the sake of other people around you – to be careful how you carry your ladder. This is on my mind because of something that happened to me last spring. I was strolling down a residential street in Kitsilano, enjoying the first warm day of the year, admiring the flowers in bloom – when suddenly a ladder jutted out across my path. It missed my head by only a few centimetres. “Whoa!” I exclaimed, and jumped back. A worker was carrying the ladder to his truck after clearing leaves from a gutter. He stopped and said, “Oh, sorry!” We paused. It was awkward. He looked genuinely sorry, so I just grimaced and continued on my way. It gave me a chill to think of what could have happened. I could have been seriously injured or worse! I’d also like to remind you to use your ladder safely and be sure it’s the right tool for the job. Six workers died and there were 4,920 accepted time-loss claims – including 1,634 serious injuries – as a result of falls from ladders across all industries in B.C. from 2012 to 2016, according to this WorkSafeBC news release. The news release also includes a link to their six new ladder safety videos. If you have anything to say about using ladders safely, please leave a comment.